This is a link to a Google 3D SketchUp drawing for a beaded panel bench with storage. You will need the SketchUp software to download this drawing and its freely available online. This 120 inch long dining table is actually meant for outdoor use and has board spacing to accommodate water run off. This would be equally as fabulous indoors, or perhaps even more fabulous because you could use it more frequently! Free Woodworking Plans for a Farmhouse Bench for Farmhouse Table. This free woodworking plan for a farmhouse bench is easy to build, with step by step instructions, and you will only need simple basic tools, lumber like 2×4 boards, and pine boards. A fabulous outdoor coffee table, though I honestly feel like this entire collection would be amazing inside too! This pass-through brings a more spacious feel to the house and provides two additional seats for those big family dinners. Here is how we knocked down a wall and built up a pass-through. Information at Extreme How To. 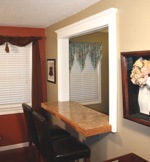 Cinch Bench free woodworking plan. This easy-to-build bench works great in indoor and outdoor spaces and features fun scroll work. This plan is so much fun! It functions as a bar cart, media stand, dining buffet, and any other thing you might desire! Free plans to build a Cottage Bench. A simple cottage style entryway bench with under seat storage cubbies. Two large, roomy cubbies. Though the bench itself is small, the seat is adult height and size. Free plans to build a Farmhouse Bench. This farmhouse bench is easy to build and is rustic and substantial. It measures 72 inches long when complete but you can modify the length to suit your needs. Bench with Open Storage free building plan. A small bench over an enclosed shelf makes a stylish seat with storage. Build it using the free plans provided at the link.